Covered bridge fans flocking to Ashtabula County in northeastern Ohio earlier this month for an annual festival celebrating the county's covered spans found something new to celebrate with the official dedication of the nation's shortest covered bridge. The West Liberty Street Bridge, with its 18-foot span, is the county's 18th covered bridge provides the perfect bookend to a list of county covered bridges that includes the nation's largest covered bridge, the 613-foot-long Smolen-Gulf Covered Bridge. Former Ashtabula County Engineer John Smolen became an early advocate of replacing crumbling concrete and deteriorating metal bridges with wooden covered bridges, an alternative he said was less costly and more durable than other types of bridge construction. 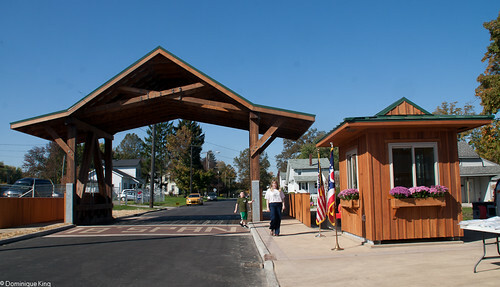 Smolen established his own engineering firm after retiring from the county and continues to design covered bridges like the West Liberty Street span for Ashtabula County. Students from the Ashtabula County Joint Vocational School took two years to construct the little bridge. I wrote about this bridge when it was still in the planning stages, so I was thrilled to be able to see it in person and take a few photos when we recently revisited Ashtabula. 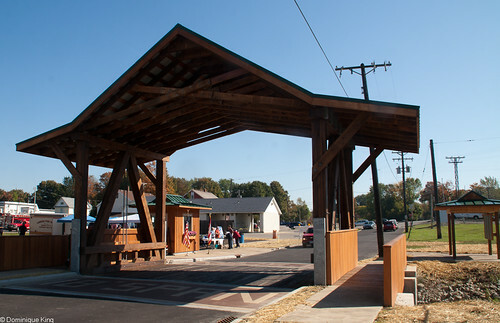 The West Liberty Street Bridge features scissors-truss construction. The roof line of a small replica toll booth alongside echoes the roofline of the bridge itself. 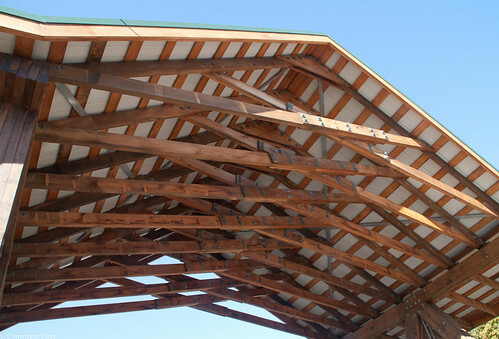 The Covered Bridge Festival is over for this year, but you can always take a self-guided tour of the Ashtabula County covered bridges. You can check out my five-part series about the bridges (Part 1, Part 2, Part 3, Part 4, Part 5), and plan your road trip with the help of the Delorme Ohio Atlas & Gazetteer. I like the idea of replacing bridges that would need replacement anyway with this, and that the vocational school students got to build it, too. creative ideas all around -- as is your story on it. thanks. 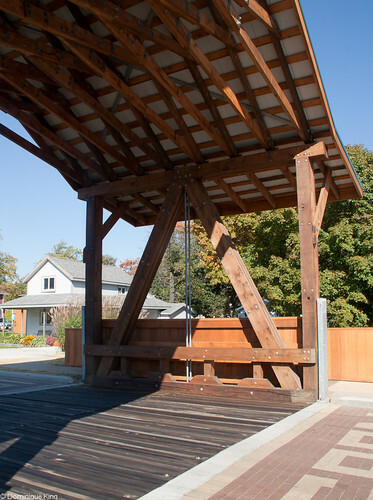 I like the idea of putting up new covered bridges, and this particular one seems to have been a real community project (voc school students building it, donated materials, etc). A bridge like this certainly has more character than most, and it's a great addition in a county where they celebrate the covered bridges. And it's so much nicer to look at than a concrete bridge! Lisa-they are pretty picturesque, aren't they?